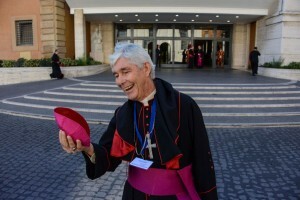 Bishop Hurley outside the Synod hall. Photo by Fiona Basile. 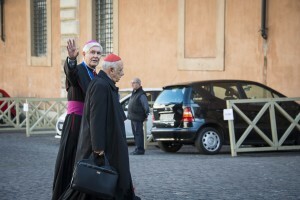 For the past three weeks, Bishop Eugene Hurley of Darwin has been in Rome attending the XIV Ordinary General Assembly of the Synod of Bishops, discussing the theme: ‘The vocation and the mission of the family in the Church and the contemporary world’. He was accompanied in Rome by fellow Australian bishops Mark Coleridge of Brisbane and Bishop Antoine Tarabay OLM of the Maronite Church. In the final days, Bishop Hurley took some time out to catch up with fellow Australian and photojournalist Fiona Basile. Tell me about your experience of the synod. I think my overwhelming sense is one of great privilege. 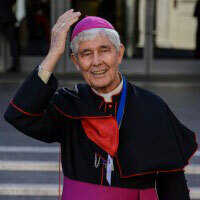 Firstly, to represent the Australian Church as a representative of the Australian Catholic Bishops Conference, and secondly, it’s an enormous responsibility to listen carefully to the real lives of families, particularly Catholic families, many of whom find themselves trying to manage the Church’s teaching. They’re great people of great faith and I think we need to listen really carefully to the struggles they’re having. I think the whole theme of the synod has been that reverential listening, which is a lovely term. It’s not just listening; it’s really reverent. There’s a real reverence for the goodness, fidelity, faithfulness and prayerfulness of families. We constantly talk about the mission of the Church to the family, but from my point of view, I am very convinced of the mission of the family to the wider Church. We talk about the family being the domestic church and if that’s true, and it is, then it has a profound mission to the wider church. 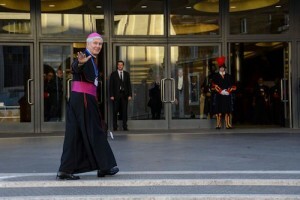 Bishop Hurley waves to photojournalist Fiona Basile. Can you elaborate on what you mean by the family being ‘the domestic church’; it’s a term we hear often. It seems to me that we have to listen reverently and carefully to the heartbeat of the family. And I think this term means exactly that—families are really the heartbeat of the Church. We have to remember that Jesus was born into a family, and the great reverence he had for Mary and Joseph and that whole sense of baptism that we’re called to be who we are, but primarily in our family. As I travelled here thinking and praying about all of this, I was just struck by the fact that every person I saw, every person I met, every person I travelled with, every person I passed in the street, wherever I was in the world, their first experience of life was in a family. Most of us have been deeply formed by our family. Now, if this is true, then that’s the vocation of the family, called by God to be the first and best teachers, the formers of the people of God. And I think that’s one of the really wonderful and beautiful things coming out of the synod; that there is a sense that we are accompanying one another on this beautiful journey of faith, learning from one another, listening carefully to one another. Bishop Hurley having a chuckle. Photo by Fiona Basile. Given this is a synod about listening to people’s experience of family, tell me about your family. Most of my faith I learned in my family. Not in the seminary, not in the Catholic boarding college, not doing post-graduate studies—I mean, I learnt more about it at those places, but I didn’t learn my faith there. I heard my parents saying the Rosary every night and then I was part of it. And that’s what I want to emphasise to the people: Don’t be waiting for Catholic schools to imbue your children with faith. They’ll teach about the faith, but they will learn it essentially from in the family. Now what do we need to do to help you do that? What do you want me to do? What has to be set up? What sort of groups? Prayer groups? What sort of education? What do you need in order for you to do what you have to do? That’s my job. What is the experience of families in your diocese? In my diocese it’s a bit different in that the average age is 30, which is lovely because they’re all young families with children and the cathedral is full of children and noise; I love it. We’re building schools, rather than closing schools and we’re opening parishes. Also a third of my diocese is Aboriginal people who have a deep and wonderful culture. And I think we need to listen really carefully, attentively and with humility to that culture. It’s not a homogenous culture; it really varies. But we really need to listen very carefully to that. The other thing in my diocese that is a real heartache for me is that many families are in detention—the trauma and dysfunction that that causes. It’s just so terribly sad. I visit the detention centres now and have done so since Woomera and Baxter. But the destruction of that reality of families is something that weighs heavily on my own heart. I think that we need to be bigger than that. We need to understand that children and families do not belong in mandatory detention, particularly when they are fleeing such awful circumstances. Pope Francis speaking during the General Assembly of Bishops. Photo by Fiona Basile. 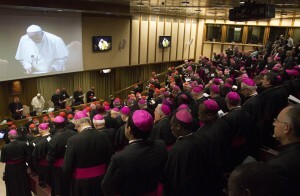 What has the feeling been among the fathers in the synod sessions? I think it’s been really enormously exciting and I have a real sense of the Holy Spirit being active. I think it’s so many people praying and I think each of us here has asked the Holy Spirit, ‘Please enlighten my mind, that I might say and do the things you want, whatever they might be’. And you just have a sense there is a newness, a springtime, particularly centred around the beauty, sacredness and vocation of family. How has the synod reconciled or brought together all the different experiences and viewpoints when it comes to the vocation of families? When we talk of families, we talk of all families. There are broken families, there are wonderful families, young families, people who are single or widowed. They’re all part of family life. And I think this synod has tried really hard—and I have been really impressed with how people have struggled—to not leave anybody out, because our Lord himself didn’t leave anybody out. He sat with the Samaritan woman—he scandalised a few people doing that! But his first commandment was ‘to love one another’. Bishop Hurley waving. Photo by Fiona Basile. The lovely thing about the synod is that the Holy Father has asked people to be frank and open. And synods are about listening to one another and there are different points of view. There are very different cultures here—one faith, many cultures. And I think that we need to listen really carefully to all of that. But in the end, this is a pastoral synod, it’s about how do we do things? So when people talk about this doctrine and that doctrine, that’s all certainly in place, but what we’re looking at now is, How do we accompany people? How do we reach out to people? How do we engage people? How do we show mercy? How is the compassion of the Church clear for people? How do we look after good families? How do we stretch ourselves to embrace people and not exclude people? How do we walk with people who are wounded? How do we set up things in such a way that we are inviting, engaging, offering to listen, to accompany people, and to offer solutions to their woundedness? The focus of the synod is, how do we bring the healing love of Jesus Christ to the people, particularly in the Catholic Church, but wider than that. How do we bring life and energy and a sense of grandeur to families, particularly those who are struggling? How do we walk with people? That’s what the synod is about. And I think there are themes developing, there’s a joining of hands across nations about that. This is what the Holy Spirit is calling the Church to. Final Synod document. Photo by Fiona Basile. I think one of the lovely things that has come out of the synod and which was discussed at the previous Synod of the Family, is the profound place of sexuality in marriage; recognising the real sacredness, beauty and life-giving nature of sexuality within marriage. I know a number of us were anxious that this not be lost. Not only was it not lost it was taken up as a theme and I think that’s lovely because it presents to the world this whole idea that conjugal sexuality is healing, life-giving and reconciling. It’s a wonderful, beautiful part of human nature and I think it exalts the whole idea of priestly celibacy as well. It sounds strange but I would say to people, the reason I am celibate is the same reason that my best friends are married. They want to love each other exclusively, totally and with their whole heart and their whole self and they have made a covenant of love to each other. And I believe that my covenant of love is with the people; that I couldn’t have lived my life the way I have and also have been a husband and a father. I’ve tried to be available to people night and day, weekends, week in, week out, year in, year out, and that’s my covenant of love with them. And I think the more beautiful the covenant of love is between married couples, the more beautiful my celibacy is. Rather than something you don’t do, or have given up, I have said yes, with all the ups and downs, frustrations, beauty and profundity of it, just as a married couple says yes. What will you do when you go back to Australia? 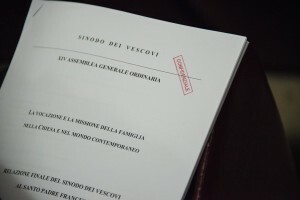 Immediately upon my return I will begin to introduce some of the elements around the new Motu Proprio document, which the pope released on annulment procedures, so that we’re ready to go as soon as it’s authorised. I also want to have a whole Year of Reflection but with a particular regard to family life. This means we’ll set up strategies and groups that will make sure that those things happen. It won’t be just another document, it won’t just be another meeting that the bishop went to. People will see things happening. And they won’t be happening by the bishops and priests, they’ll be happening by the people, with the bishops and priests. I’ll be calling on the families to now take the lead in what we’ve suggested is their vocation, their covenant of love, their real role as domestic church. So watch this space! 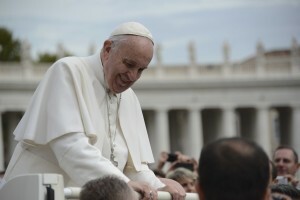 Kairos Photojournalist, Fiona Basile, reported on the Synod process for the ACBC from the Vatican, Rome.